When we launched SchoolDash a year ago, a central aspiration was to help parents and other stakeholders (including governors, teachers and kids themselves) make better-informed decisions about schools. We hope that over the last year our statistics and analyses, among other things, have provided insight at national and regional levels. But as with politics, all education is ultimately local and for this reason we've always wanted to provide a window into individual communities and schools. Today's launch of SchoolDash Explorer is an important step towards this goal. 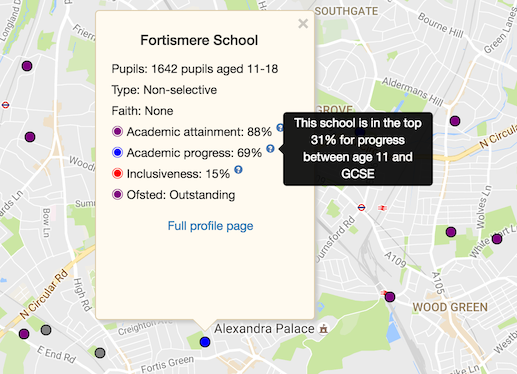 For the first time there is a way to quickly survey the schools in a local area and understand something about their characteristics, from academic performance and Ofsted rating to religious denomination and social inclusiveness. Parental choice has been at the heart of government education policy since I can remember (and I'm no spring chicken). But choices made without access to all the relevant facts are likely to not only be bad ones for the families concerned but also to create distortions that make the whole system system less effective for everyone. With an education system that's becoming ever more fragmented and complex – community schools, grammar schools, independent schools, faith schools, voluntary-aided schools, free schools, converter academies, sponsor-led academies, multi-academy trusts, city technology colleges and so on – it's only getting harder to stay well informed. We believe in the power of technology and facts to overcome ignorance and empower individuals, and we hope that SchoolDash Explorer will prove a useful contribution to this cause. We're just getting started, so look out for more updates in the near future – and if you have a suggestion for how to make the service better then please get in touch. This is the SchoolDash blog, where we write about education, data geekery and other things that spark our interest. Blue links take you to other parts of the page, or to other web pages. Red links control the figures to show you what we're talking about.